On 17 March 2011 light collected by all four of the 8-metre Unit Telescopes of ESO’s Very Large Telescope was successfully combined for the first time using PIONIER , a new generation instrument in the VLT Interferometer. 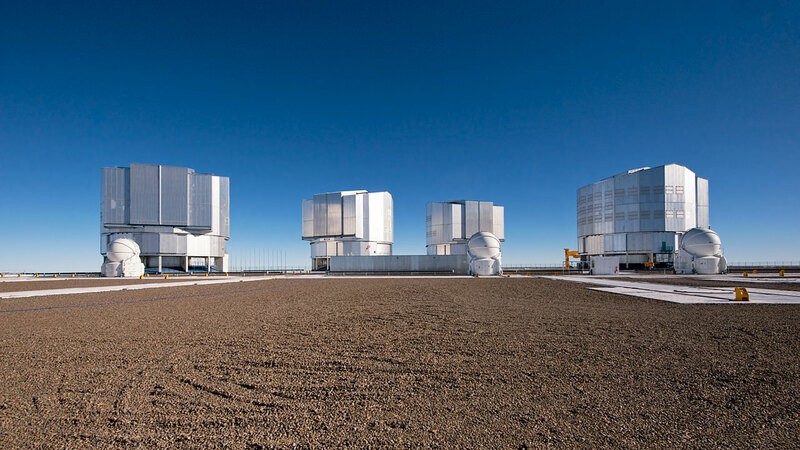 To have all four Unit Telescopes (UTs) finally working together as a single telescope is a major step in the development of the VLT — the original design always anticipated that the four 8-metre telescopes would be able to work either independently or together as part of the giant VLT Interferometer (VLTI). Coincidentally, the new observations took place on the 10th anniversary of the first successful combination of two beams within the VLTI. Among the main science goals for the four UTs, working together with PIONIER, are to try to reveal the signatures of planets in the making, to explore the natures and fates of stars by providing images of their surfaces and their environments and to understand better the powerful engines associated with black holes at the centres of galaxies. When combined, the UTs can potentially provide image sharpness that equals that of a telescope with a diameter of up to 130 metres. Three telescopes have been combined regularly since the VLT/VLTI began observing, offering three unique baselines; the ability to combine four telescopes bumps this number up to six and allows the very fine structure in astronomical objects to be studied much more easily. An earlier important step towards unleashing the full potential of the VLTI was when light from all four of the 1.8-metre VLT Auxiliary Telescopes (ATs) was combined using PIONIER (see earlier announcement ann1081). PIONIER, developed at LAOG/IPAG in Grenoble, France, is a visiting instrument at the Paranal Observatory. PIONIER is funded by Université Joseph Fourier, IPAG, INSU-CNRS (ASHRA-PNPS-PNP) ANR 2G-VLTI ANR Exozodi. IPAG is part of the Grenoble Observatory (OSUG). This article was corrected on 18 May 2011 to state "working together the four large telescopes can pick up details about 16 times finer than can be seen with one UT." The original statement of "25 times finer than can be seen with one UT." referred to the use of the smaller VLT Auxiliary Telescopes compared to one UT.